Brooke Hart was born on 11 June 1911, the son of Alexander Hart, the wealthy owner of L. Hart & Son department store. A popular young man, he worked in the family business and was being groomed to take over from his father. On a November afternoon in 1933 he went to downtown San Jose to collect his Studebaker from a garage. As he got the car, Thomas Harold Thurmond and John Maurice Holmes kidnapped him. He was driven to what is now Milpitas, where the kidnappers changed cars and headed for the San Mateo-Hayward Bridge. At the bridge Hart was hit over the head with a concrete block and thrown into the San Francisco Bay. Since the tide was out and the water wasn’t very deep, the kidnappers completed their murder by shooting Hart. At 9.30pm that night they contacted Hart’s father to inform him of the kidnapping. At 10.30pm they called again and demanded a ransom of $40,000. More ransom demands, followed including ones that demanded that Alexander Hart drive to a location with the money, but Hart had never learned to drive. At 8am on 15 November Thomas Thurmond was arrested at a payphone 137 m (150 yd) from the San Jose police station. At 3am he finally confessed to the kidnap and said that he had bound Brooke Hart with wire and thrown him off the San Mateo-Hayward Bridge on the night of the kidnapping. The two men were indicted on 22 November and faced 20 years in prison and a $5,000 fine. Four days later, two duck hunters found the badly decomposed body of Brooke Hart south of the San Mateo-Hayward Bridge. His body had been severely damaged by crabs and eels. The face and hair had been eaten away and the hands and feet were destroyed. By 9pm the same day a crowd of 5,000 had gathered outside the San Jose jail where the kidnappers were held. At 11pm they broke into the jail and grabbed the two men. 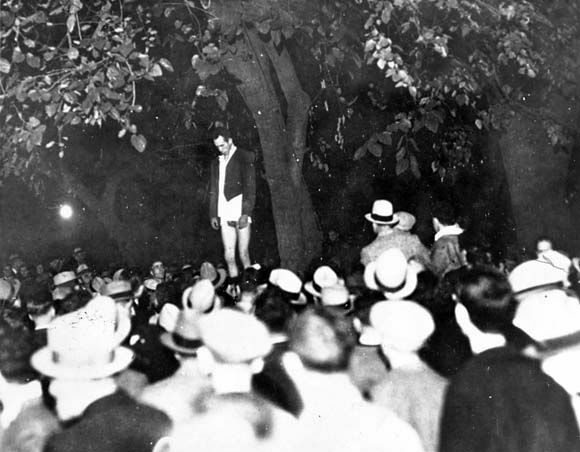 Thurmond was knocked unconscious and hanged from a tree in the local St James Park. Holmes continued to fight until the mob broke both his arms. Then he was stripped naked and lifted up while he kicked frantically into the air. The day after the lynching, Governor James Rolph expressed his approval of the double murder. After John Holmes and Harold Thurmond murdered Brooke Hart, Holmes took his wife to the cinema to watch Disney’s The Three Little Pigs.